Any way you slice it - works. Summertime in Lompoc means the Old Town Market will be up and running. This year the Cha Cha Cooking Club teamed up with the Santa Rita Flower Farm CSA and the Flower Valley Country Store to share fresh cucumbers. You could earn a free fresh from the organic farm cucumber just by taking the Cucumber Quiz. Name 3 different kinds of cucumbers: This questions inevitable resulted in the discussion of how to prepare and enjoy this juicy vegetable. 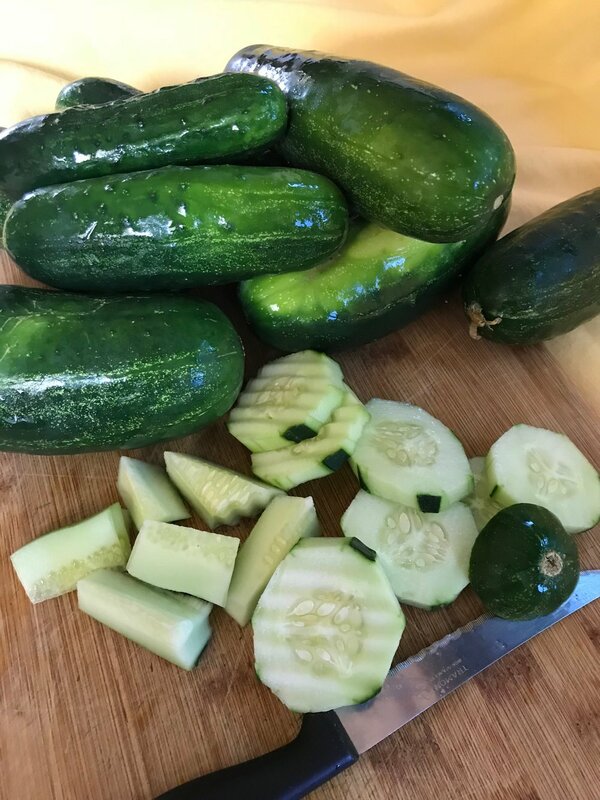 Lemon Cukes are a big favorite when in season (thin sliced with red onions and just a splash of rice vinegar, salt & pepper), gherkins are for pickling, and field cucumbers are available year round in the store for salads. An Old Town Favorite recipe – Peco de Gallo. Peco de Gallo is delicious. And, very healthy. Fresh cucumbers, tomatoes, peppers, onion, garlic, cilantro, parsley, limes and lemons, pepper and salt. Easy breeze and a tasty change from bottled salsa. Growing cucumbers is fairly easy. UCCE (University of California Community Education) Master Gardener Program will provide lots of great growing advice. Cucumbers can have a very bitter taste due to cucurbitacin, a biochemical compound that is a natural defense against herbivores. But do not be afraid. Just take my advice: after washing the fresh cuke cut the ends off first before slicing the rest. Seems to flush the bitterness out.